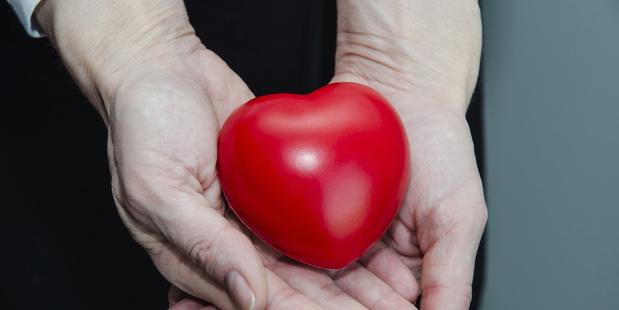 New Zealand's rate of deceased organ donors is low by international standards. Health reporter Martin Johnston investigates why, and what could be done to increase the rate. Appealing to people's survival instincts could help increase New Zealand's internationally low rate of deceased organ donors, a campaigner reckons. Andy Tookey says what definitely works is high-profile donor cases in which the public becomes intensely interested because of personal tragedy. Some countries have a donor register. People can have their names entered and this can help families to approve donation if the person arrives in a hospital with a non-survivable condition. Some do it the other way around: adults are deemed to have given consent unless they "opt off" by telling the register they don't want to be a donor. Spain and Austria do this and Wales will this year. If New Zealanders want to be a donor, it can be stated on our driver licence. It's the number-8-wire relative of a register. Mr Tookey, whose teenage daughter Katie will need a liver transplant eventually, faults the licence database, but also, tongue in cheek, suggests an improvement. "They ask, donor, yes or no. If they put a question before that, 'If you need an organ to live, would you accept one', if they tick yes to that, they are hardly likely to say no to the next question." He aims to stimulate donation discussion in families - because families and their knowledge of their loved one's wishes influence intensive care staff, the gatekeepers of deceased organ donation. In 2004 the then-Labour Government hoped more funding for an expanded donor agency would increase donation by half. That hasn't happened. In 2003 there were 40 deceased donors and last year, 46. The average per year is 37, with a low of 25 in 2006. This week Health Minister Jonathan Coleman hailed last year's "record" - which it was, at three more than in 2009. 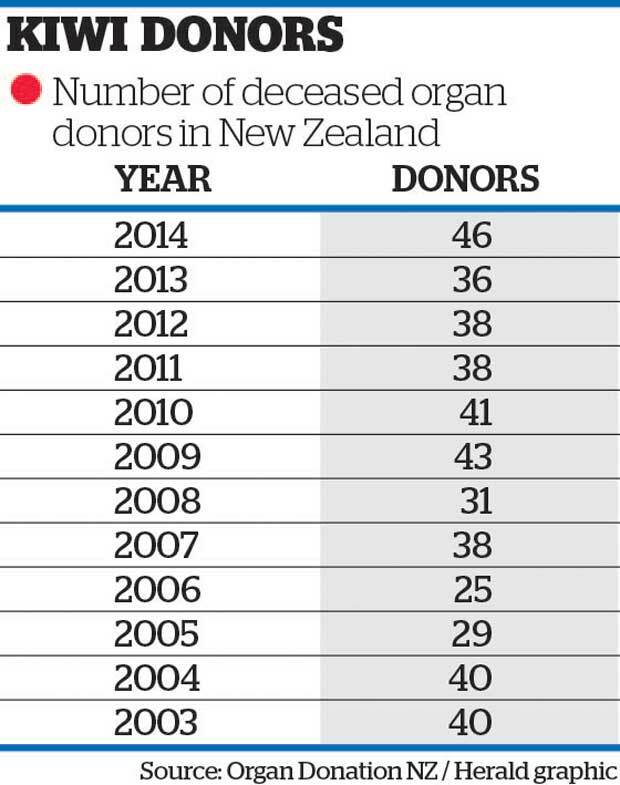 But Organ Donation NZ omits to highlight that not all donors have donated organs. Four "donors" last year had none transplanted, arguably reducing the tally to 42. Most years three or four "donors" are in this category. New Zealand patients become "donors" when a surgical incision is made for transplantation, even if later deemed medically unsuitable and no organs are removed. Some countries count a person as a donor only if an organ is transplanted. Our donor rate per million population, at less than nine, is around half of Australia's, and far below the world leader Spain on about 35. There are 640 patients on the waiting list for a kidney transplant from a deceased donor; 24 are on the liver list; heart, 8; and lung 14. Some patients are de-listed if no longer considered suitable for a transplant. Some die waiting - from their diseased organ or other causes - but detailed statistics aren't kept. Dr Nick Cross, National Renal Transplant Service clinical director, said: "In the long run one-third of people on the deceased donor [kidney] waiting list will be transplanted and two-thirds will continue to wait and be removed from the list or die while waiting." Mr Tookey said Italy had one of the biggest donor increases, from the "Nicholas effect". Californian Nicholas Green, 7, on holiday in Italy with his family in 1994, was killed in a robbery. His parents agreed to donate his organs and corneas, which went to seven Italians. Italy's donor rate has more than tripled since. When an ICU patient's brain dies, perhaps from a road crash, a breathing ventilator can keep their other organs alive while their family is asked about donation. Grief may make it hard for a family to hear their loved one's death could save others. Fifty-three per cent of licence holders have indicated "yes" to being a donor, but ICU and donor staff don't routinely check the database. Janice Langlands, of Organ Donation NZ , said they looked only if the family asked, as many already knew their loved one's wishes. The Health Ministry says if family members report the person had stated their wish regarding donation, doctors are legally permitted to act on this, but can choose to follow the family's position, even if it contradicts the patient's. If the patient did not state a view, then consent or objection can be sought from the patient's nominee, if he or she appointed one, or if not, from the immediate family, including others who were in a close relationship with the person. Ms Langlands said ICU staff followed families' wishes out of concern for their wellbeing. "I personally don't believe that we should ever be more interested in the potential recipients and the wellbeing of an unknown recipient than we are about the wellbeing and health of that family at the time ... The health professionals who care for those families are ultimately there to save the lives of their loved ones and when that's not possible, then to assist the family through that process of ... understanding that their family member has died." Families did not always oppose donation. Some permitted donation even when the licence said no, as the person had falsely believed he or she was too old. Mr Tookey said many countries valued their register but one would work here only if done well. Wide advertising was needed too, not the current approach of pamphlets and a website. Ms Langlands said registries alone didn't lift donor rates and it was hard to measure if public awareness campaigns made any difference although "encouraging a conversation is fine". Boosting funding in ICUs and focusing on respectful donor services was the most reliable way to an increase. A bright spot last year was our increase in live kidney donors to 72, from an average of 56 per year for a decade, helping raise the number of transplant recipients to 214, from 175 in 2013. Dr Coleman said the Government had made four-year allocations of $4 million to increase live kidney donations, and $4 million to encourage more deceased donation. Some point out this is small compared with the $248 million spent on organ donation since 2009 in Australia, where rates increased sharply, before dipping last year. It is nearly 12 years since Pauline Murphy received her new heart and she is enjoying her good health. Gone is the mental cloudiness and the physical breathlessness, the markers of her failing heart. She had cardiomyopathy, a disease that weakens the heart's ability to pump blood. 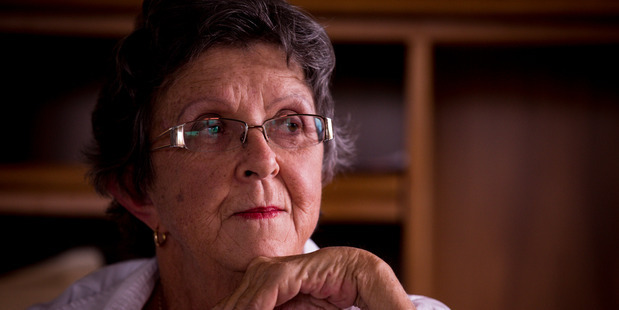 For a decade, her heart got progressively worse and she took a variety of drugs, had surgery to replace a heart valve, and went through two pacemakers. "Every couple of years I would be fine, then I would go into heart failure," said Ms Murphy, 61, of Pt Chevalier, Auckland. At the end of 2002, her specialist told her the only option was a new heart and for several months she waited anxiously for the call to the transplant unit, which was then at Green Lane Hospital. The operation didn't all go according to plan and several weeks later she suffered an episode of acute rejection of the new heart, which was treated with high doses of a steroid medicine. However, she did recover and has gone from strength to strength. "It's a pleasure to get up in the mornings now. I wake up not having to deal with that terrible feeling when it was just a struggle all day trying to breathe and keep on doing things around the house. I had stopped picking up the cat because that was too much of an effort. "I got vaguer and vaguer at work," said the former Herald librarian. "I couldn't remember if I was on morning or afternoon shifts." But now, she declares herself "reasonably fit". She goes for a 3km walk once a week and she mows the lawn with an electric mower. "My sister and I went on a long holiday in 2010 [to Europe and Britain]. I went on a big OE at the age of 57." She has suffered no further rejection episodes and the anti-rejection drugs don't trouble her, although because they suppress her immune system she tries hard to avoid infections. Asked for her views on organ donation, Ms Murphy said: "It's very important. I wouldn't be here. "A day doesn't go by that I don't think about the generosity and kindness of the family ...," she trails off. "I don't know anything about her. All I know is that the donor was a woman and that she must have been more or less my size as the heart has to have the same blood group and size." Richard Love's views about organ donation changed when he was told he needed a kidney transplant. A Maori, he said his culture had taught him it was wrong for organs to be removed from a dead body and transplanted into other people. "I was brought up to believe once you are gone, that's it and your family put you in a coffin, they put you in the ground - the whole person. "But now I can see that it gives people a second chance. I have had a couple of friends who have been lucky enough to have transplants. It's changed their lives." 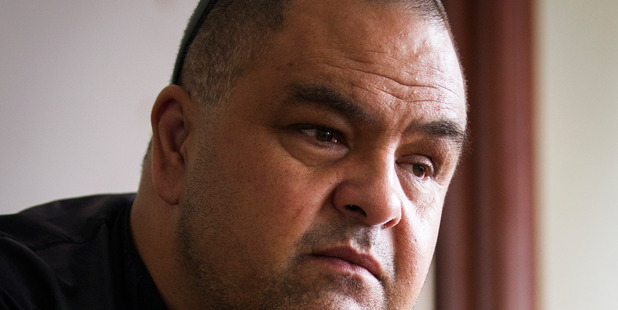 Mr Love, of Otara in South Auckland, was put on the waiting list for a kidney from a deceased donor in 2010. He went blind in his left eye the same year and now, aged 44, he has only 30 per cent of normal vision in his right eye. The kidney and eye damage were caused by type 2 diabetes, which was diagnosed when he was in his late 20s. At about 183cm in height and weighing 110kg, he had been advised by his doctor he would feel better at 95kg. In 2009, Mr Love began haemodialysis. Three times a week he is taken by taxi to a Greenlane clinic where he is hooked up to the machine that clears his blood of the waste products his faulty kidneys can no longer remove. As the time approaches for kidney dialysis, Mr Love starts feeling nauseous. After the six-hour sessions, "I feel regenerated again". He looked into the possibility of having a living kidney donor but, despite the generosity of siblings, he hit medical and lifestyle barriers. Mr Love's hopes are now pinned on the deceased donor programme. "I'm looking forward to it so my son [aged 6] can hopefully experience me as normal as I can be. At the moment he's only known me as a dialysis patient."